Some people may find it hard to believe that a private mission will succeed in landing four astronauts on Mars in 2023, but several state-run media outlets in China are targeting the project with even harsher terms like "hoax" and "hype." Doubts have been growing in China about the legitimacy of Mars One, the Netherlands-based nonprofit that seeks to establish a colony on the Red Planet 10 years from now. China's People's Daily newspaper, for example, ran a story Tuesday (May 21) headlined "Settlement on Mars a hoax? Over 10,000 Chinese people fall for it." Journalists discovered that Mars One's registered address is the home of the organization's co-founder and CEO, Bas Lansdorp, in the Dutch city of Amersfoort, People's Daily reported. And its headquarters are based at a rented office, the paper added. "When the reporters went to the office of the company, they did not see any sign or logo of Mars One," the newspaper reported. "Lansdorp and his colleagues only occupied a few tables in a large open office area. Therefore, media assumed that Mars One project is probably a commercial scam." People's Daily also said that "a Chinese scholar" regarded Mars One as "blatant commercial hype." Mars One officials have fought back against the accusations and insinuations, stressing that their ambitious plans are for real. "Mars One is making good progress on its plans. We have already contracted an American company to start work on the Environmental Control and Life Support System and Mars Surface Exploration Spacesuit System," Mars One's Aashima Dogra told the Global Times (a People's Daily affiliate) via e-mail, according to People's Daily. That company is Arizona-based Paragon Space Development Corp., whose deal with Mars One was announced in March. Paragon is also working with the nonprofit Inspiration Mars Foundation on its plan to launch two astronauts on a flyby journey around the Red Planet in January 2018. Lansdorp weighed in as well, telling yet another newspaper via email that it made sense to register the organization at his home address rather than at a rented office. And though delays are possible, the project remains on schedule at the moment, he added. "Our plan is very complicated, but we knew that when we started," Lansdorp told China Daily, according to People's Daily. "We are committed to landing humans on Mars in 2023." Lansdorp and other Mars One officials have stressed that the project is indeed feasible, requiring no big technological leaps. "This mission is based on existing technology," Lansdorp said Tuesday at the Space Tech Expo 2013 conference in Long Beach, Calif. "Almost nothing new is needed. And each step is proved before risking lives on the next one." Mars One estimates that it will cost about $6 billion to land four astronauts on Mars in 2023. The nonprofit aims to launch additional crews every two years thereafter, at a cost of around $4 billion each. 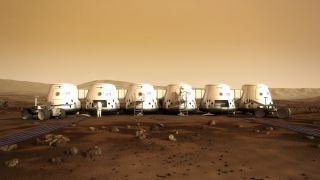 Mars One plans to foot the bill primarily by staging a global reality-TV event, with cameras documenting all phases of the project from astronaut selection to the colonists' first years on the Red Planet. These Red Planet missions will all be one-way affairs; there are no plans to bring any of the pioneers back to Earth. Still, nearly 80,000 people submitted applications to Mars One in the first two weeks after the selection process opened, officials said.